I’m going to let you in on a little secret; like a lot of makers, I HATE mending and alterations. I like to make stuff! Not rip out stuff I’ve already done and re-do it! But the flip side to this is that I know exactly how much work and materials went into my clothes. Therefore, I know that they are worth mending. Most of the things that I make hold up very well over time. In fact, I still have the very first garment I ever made. It is a pair of pyjama pants, and they would be wearable if the waist elastic still worked (all elastics inevitably loose their stretch over time). 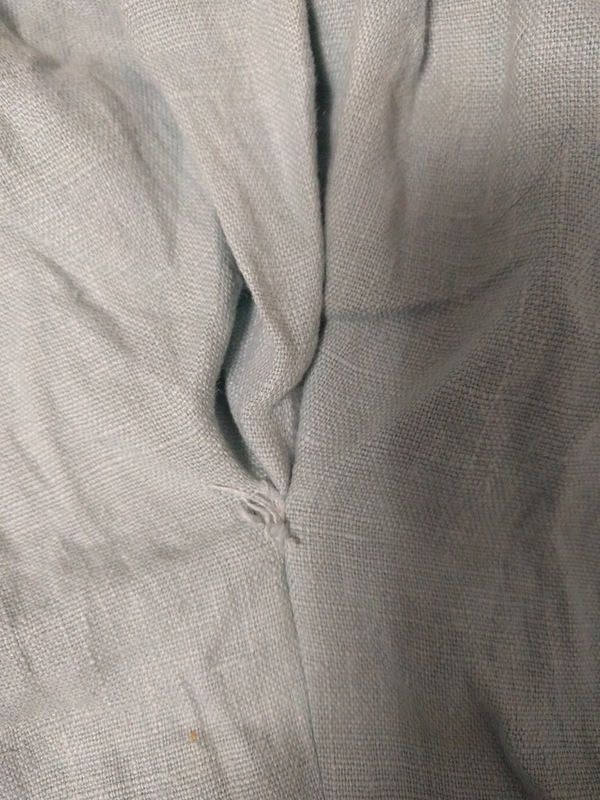 I could replace the elastic, but, since they are over 15 years old, the fabric is starting to wear thin. Even though my garments are sturdy, wear happens. Since I hate mending, when something needs mending, I toss it into my mending pile, where it… waits. Recently, our washing machine was broken, so I couldn’t pre-wash the new fabrics that I wanted to work on. Although not being able to do laundry was super annoying (don’t worry, it’s fixed now– and we fixed it ourselves!! 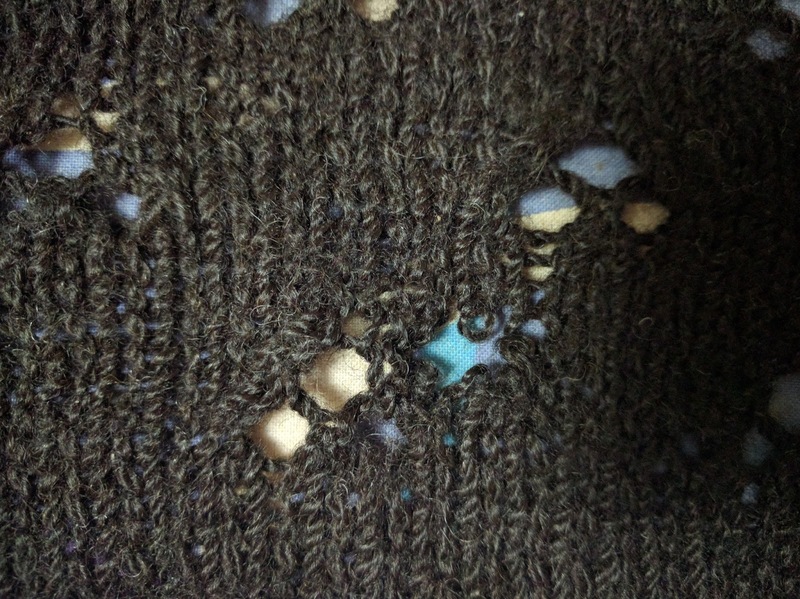 ), it did force me to finally tackle my mending pile. 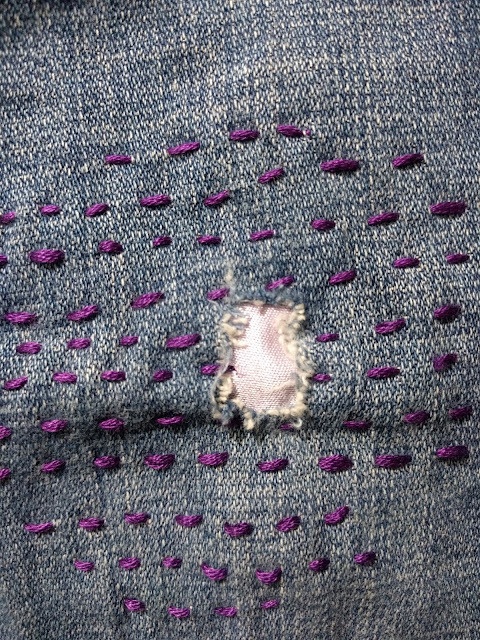 Before I started, I perused some examples of using mending as a kind of artwork. These examples were inspired by the Japanese tradition of boro, which involved using patches of fabric combined with sashiko embroidery. The idea is not too hide the mending, but instead use it as an opportunity to make the garment more beautiful. With this idea in mind, I wanted to share a few examples of my mending. The first is a repair on this skirt. I packed this skirt for my wedding trip, and it got a lot of use. Since the gusseted pleats create a lot of stress at the top of the gusset, I probably should have reinforced that area when I made it. I didn’t, so it ended up ripping. 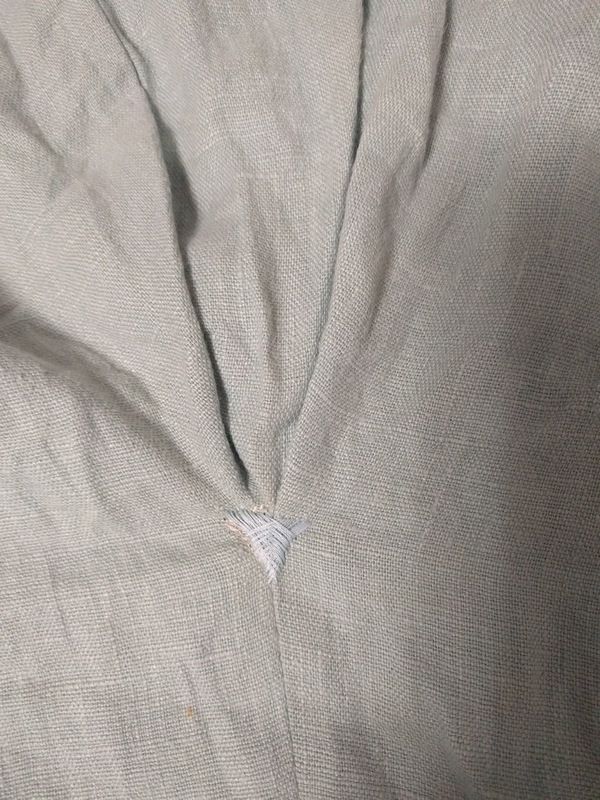 To repair it, I first re-stitched the seam. I then did an arrowhead tack over each point (this is what I should have done in the first place). I added a second tack over the other pleat. Although this stitch is functional, it also adds a little something special to the skirt. The second mending example does not really add anything to the garment, but it was very necessary. This is a hand-knit sweater (see my Ravelry post on it) made from alpaca. The wool is quite special to me as the alpaca it came from was owned by a friend of my mom. I even got to meet the alpaca. Unfortunately, my old apartment was infested with carpet beetles that put a lot of holes in my clothes. Those things are really evil– luckily, we seem to have not brought them to the new house. Since this sweater is such a nice material, and handmade, I really wanted to make it wearable again. Most of the holes are lace stitches. But you can the hole that need repairing in between two of the lace repeats. 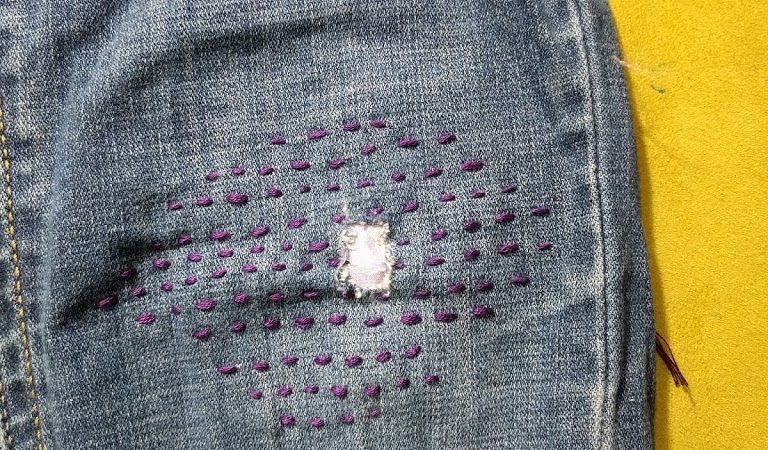 The first thing I did was to use sewing thread to weave a grid pattern across the hole and through the surrounding stitches. For the smaller holes, this is sufficient if you just draw the remaining stitches closer. For larger holes, I wove some of the original yarn into the grid of thread, picking up an stitches that had visible loops. This is my standard repair for any handknit. The final piece I wanted to share actually uses shashiko. 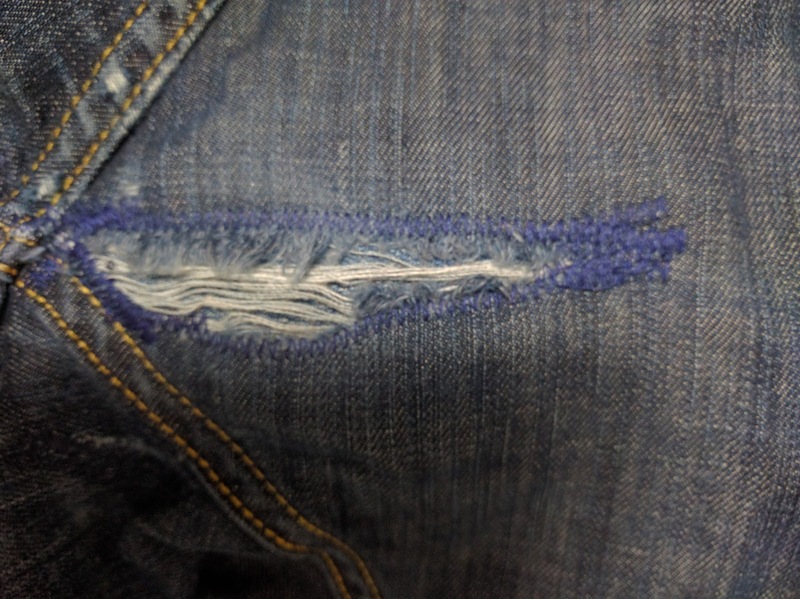 These jeans are not handmade, but they are definitely still worth repairing. I used a scrap left over from my wedding dress because it was the only scrap I had that I liked for this. I then used sashiko stitches to make it even more visible. It was a fun change from my usual jeans mending where I try to make it inconspicuous. I don’t know that I would do it this more obvious way all the time (for one thing, I’m pretty sure Wade would not appreciate it), but it was fun to do. 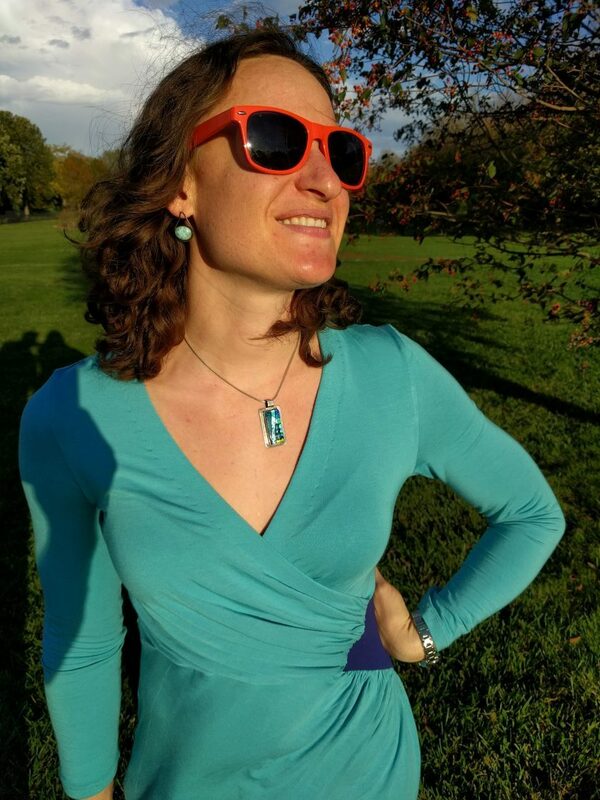 I hope that this post inspires you to mend your own clothes. Whether you made your clothes or bought them, a significant amount of resources went into them. Someone sewed them–probably someone who wasn’t paid a fair wage. 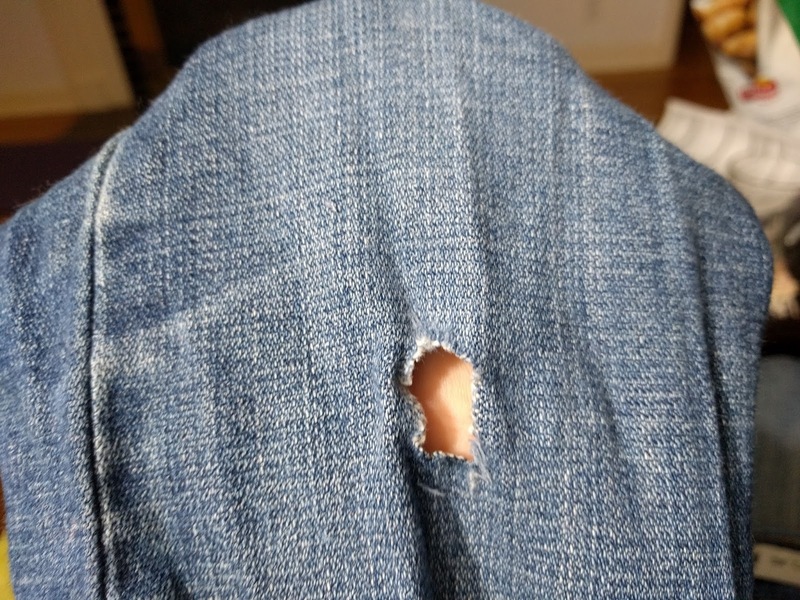 Next time you go to toss a garment, stop and think about whether that hole could be a way to make it into something unique. Repair of Wade’s jeans; this is my more typical jeans repair technique.